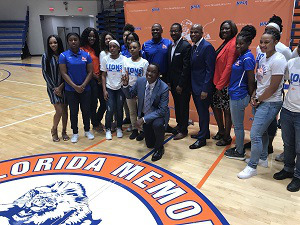 Isiah Thomas, a two-time NBA champion, is encouraging community members to support historically Black colleges and universities (HBCUs) through a new partnership with Florida Memorial University (FMU) in Miami Gardens. FMU interim president Dr. Jaffus Hardrick joined Thomas for the launch of the NBA legend’s initiative “Lift Ev’ry Voice” on Tuesday. The initiative is “intended to inspire successful athletes, entertainers and other influential partners to re-commit, embrace and support historically Black colleges and universities,” according to an FMU statement. The name of the initiative is significant as the song “Lift Ev’ry Voice” is often referred to as the “Black National Anthem.” James Weldon Johnson initially wrote the song as a poem, but had his younger brother John Rosamond Johnson, a composer and music professor at Florida Baptist Academy – now known as FMU – set the words to music. On the day of Thomas’ announcement, FMU also announced that its new head men’s basketball coach would be Ansar Al-Ameen. Thomas, a former player for the Detroit Pistons and a coach for several NBA and college basketball teams including the Indiana Pacers, New York Knicks and Florida International University, said he has known Al-Ameen for years. “I’m positive that with these young athletes that we have here, he’ll impart knowledge and he’ll impart wisdom,” Thomas said.